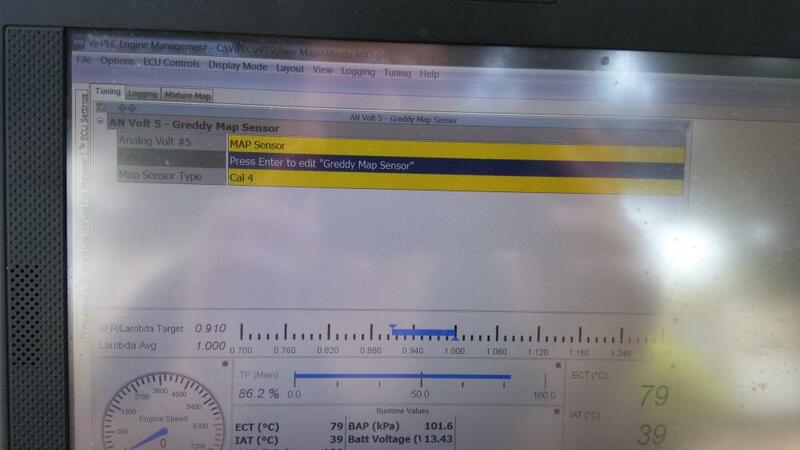 I want to use my existing Greddy 3 Bar Map Sensor with my Vipec i88 ECU. I have found the calibration values in order to add this but it seems difficult ....Can anyone please chime in with a CAL table in the PC Link software,i.e. an exapmle would be grate. Below is the calibration table for Greddy. And then set up matching cal as per image. Simon thanks for the heads up. I need to spend more time with the layout and the functions.I noticed that CAL tables are dedicated on linear and non linear sensors etc. I am asking so because i have some very aggresive cams with overlap and tight LSA angle that will give some tough time. The question is:On my y axis where load is aplied in this situation kpa should i start the resolution from 0kpa to which ever will be my end or should i start from negative values -100kpa?What factor defines that?When i was N/A i was watching my boost gauge reading while lifting off the throttle 550 inHg.Can this value be displayed with the calibration that my Greedy Map sensor has? I have seen maps on Turbocharged engines where the load is applied on negative values i.e. -100kpa and some times the load starts from 0kpa.I really tried to express what my question is,don't know if it makes sense. .
You should be fine but you wont know until you try. You wont have a "resolution problem" but if you may find that you have an erratic or weak MAP signal due to the cams and no longer gives a good indication of load. If that is the case you can just change the axis on your fuel table to TP. I have seen maps on Turbocharged engines where the load is applied on negative values i.e. -100kpa and some times the load starts from 0kpa.I really tried to express what my question is,don't know if it makes sense. I think you might be confusing Absolute pressure with Gauge pressure. If you use MAP (manifold absolute pressure) then full vacuum is zero. If you use MGP (manifold gauge pressure) then zero means atmospheric pressure, negative means vacuum and positive means boost. Our general recommendation is to use MGP as it compensates for changes in altitude or baro better. A fuel table axis like the example below would be a good starting point. That's correct. i have misunderstood those 2 values, MAP and MGP. I have also noticed that when i turn the Y axis from MGP to MAP the ECU says that negative values are not accepted over there.Clever! 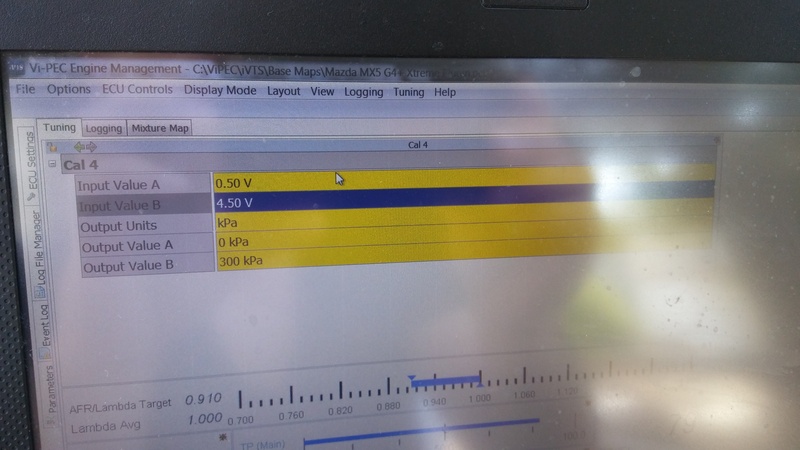 So the question is how with the CAL tables for my Greddy MAP sensor above and using MGP can i add negative values or how does the ECU gets the job done for those negative KPA values? 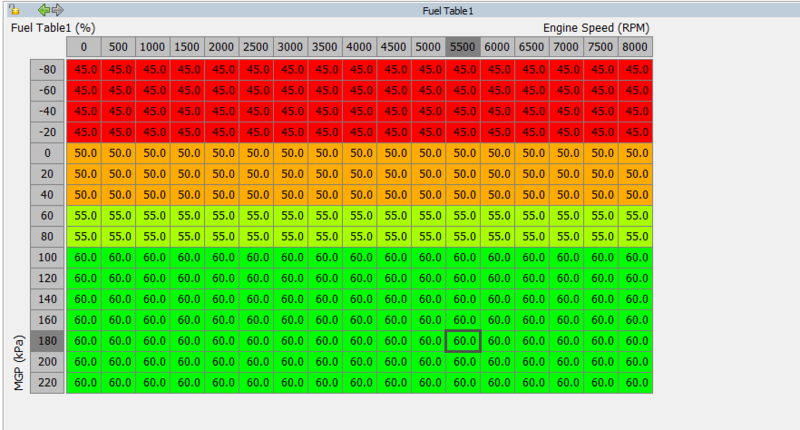 Your MAP sensor cal should be done exactly as Simon posted above and you can still use MGP on you table axis. The ECU calculates MGP itself since it knows BAP and MAP. The axis on your ignition table is not as important. I generally use MGP since I find it easier to think in "boost/vacuum".